Whether you’re printing, copying, or scanning, the AR-6023DV makes document management easy for everyone in the office. Core document functions are complemented by a range of useful advanced functions. And if the needs of your growing enterprise evolve, rest assured the AR-6023DV is ready to grow with you. Optional hardware and software upgrades let you add useful extra functions to your office setup. It all comes together in one compact, productivity-boosting package. Sharpdesk Mobile is a mobile print/scan application. With Sharpdesk Mobile, users can import documents scanned on the AR-6023DV to their mobile devices for previewing and saving. And files on a mobile device can be printed out on the MFP, sent as e-mail attachments, or used in other applications. The AR-6023DV excels as a full-colour network scanner. Quickly convert any type of paper-based document into a TIFF, PDF, or JPEG and send it to one of six pre-registered destinations. Scanned files can be sent as e-mail attachments, sent directly to a PC desktop, or scanned directly to an FTP server, and USB drive It’s all so easy—just tap the Scan Mode button, select a pre-registered destination, and press Start. 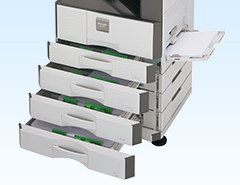 The AR-6023DV can make two-sided printouts using its built-in stackless duplex module. This effectively reduces paper costs and saves filing space. Duplex copying is even more effective when used together with the optional RSPF. For large-volume jobs and a wider selection of available paper sizes, these MFPs can accommodate two types of extra trays that increase total paper capacity to 1,850 sheets AR-6023DV. This advanced MFP can accommodate heavy paper up to 200 g/m2*, expanding the range of possible printing applications.